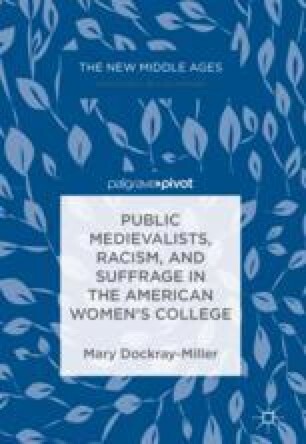 This chapter connects the community and political activity of late-nineteenth- and early-twentieth-century female Anglo-Saxonists (and medievalists more broadly) with translations of Old English poetry and with the suffrage movement. These “public medievalists” provide both role models and cautions for contemporary medievalists who similarly see the need to connect medievalism to contemporary political issues, specifically those related to resistance to burgeoning white supremacist movements. The chapter ends by advocating that those in the field need to become “Public Anglo-Saxonists” to acknowledge and confront the racism and sexism inherent in the history of our discipline as part of the project to work against contemporary racism and sexism inside and outside the university.